Quinoa, Kale and Mandarin Orange Salad, at top; French Onion Soup is pictured above. I love the smell of bread baking. It fills the house with the welcoming aroma of homemade goodness. 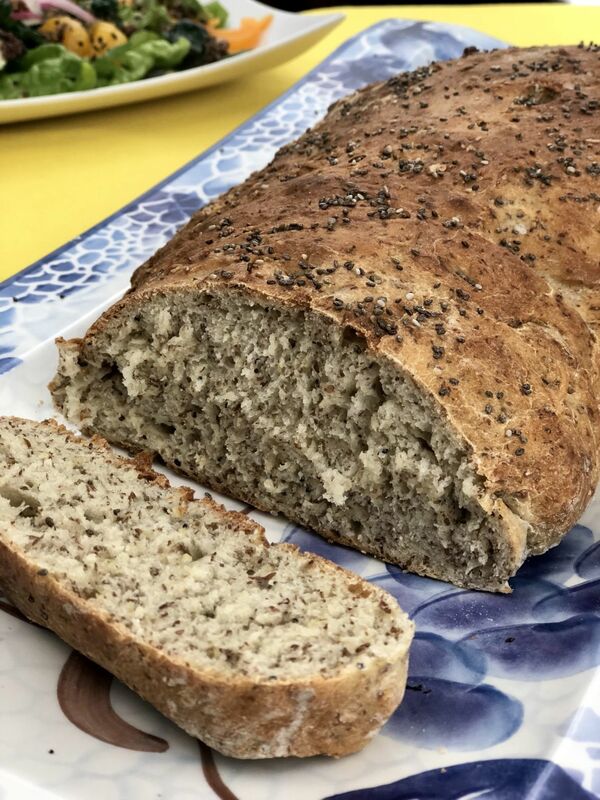 For the past few months I’ve been working on making bread from different kinds of flours and with different add-ins such as poppy seeds and ground flax meal. I finally came up with a version that everyone in the family enjoys so I’m sharing the recipe. It’s interesting that bread is one of the oldest prepared foods in the world, yet so many people have no idea how to make it or think it takes too much time or work to make it. While it’s true that some types of bread require a couple of rounds of kneading and rising before baking, this isn’t the case with all breads. The version I came up with — a rustic, seeded, honey-flax creation — requires only a half an hour of rising time before it goes in the oven. No kneading required. As for flour, I’ve been using Bob’s Red Mill brand of Artisan Bread Flour. It costs about twice what you would pay for all-purpose flour but the results are consistent and you end up with a higher quality loaf of bread that tastes like it came straight from the bakery. A loaf of store-bought bread will cost you about the same price as a bag of artisan bread flour (or any of the other high-quality flours) but you can get several loaves from a bag of flour, so it’s a good investment. I also add some ground flax into the dough, which gives a huge nutritional boost (Hippocrates wrote about flax seed around 500 B.C., recommending it to patients with abdominal problems and as a health supplement). I also add a little honey, chia or poppy seeds and some sea or Himalayan salt. I make at least three loaves of this kind of bread a week. Last week, when there was just a heel of bread left, I decided it would be put to good use in French onion soup, which is another easy-to-make dish. Simply slice some sweet onions, sauté them in a little butter, then add in a good quality beef stock and some seasonings. I like to use unsalted beef stock and add soy or tamari sauce to add a little salty flavor to my taste. Gruyere is excellent in French onion soup. If you don’t have little oven-proof dishes, lay the bread slices on a baking sheet and sprinkle them with shredded cheese, then put them under the broiler. The bread slices can be added to the soup for a hearty, substantial meal. Of course, homemade bread is always great with a salad, too. I’ve been adding quinoa to salads lately; I especially like seasoning a little Tuscan kale and mixing it in with some vegetables and lettuces. I recently made an Asian-inspired salad with mandarin oranges and a tahini-lime-soy dressing with black sesame seeds. There was a bit of salad leftover, but not a crumb of bread. Looks like I’ll have to get out the flax and flour and make another loaf. Mix the yeast, sugar and 2 tablespoons tepid water in a small bowl and let stand for about 5 minutes. Add the flour, seeds, sea salt and flax to a large bowl and stir together. Make a well in the center of the flour and add the honey and yeast mixture. Using a spatula, begin to stir and slowly add in the remaining 2 cups water. Stir, scraping the sides and bottom, until a dough ball forms. Sprinkle the dough ball with about a tablespoon of flour, then cover the bowl and set aside. Allow the dough to rise for about 30 minutes. Heat an oven to 375 degrees and line a baking sheet with parchment paper. Place the dough on the center of the parchment and pat into an oblong loaf. Sprinkle with additional poppy seeds, if desired. To get a crispy crust, place about 2 cups of ice in a heat-proof baking dish and set in the oven with the bread. Bake for 25 to 30 minutes or until the bread is golden brown. Add the butter to a stockpot and set over medium-high heat. When the butter is melted, add the onions and sprinkle with sugar. Cook the onions, stirring frequently, until they are soft, translucent and starting to brown, about 10 to 15 minutes. Sprinkle the flour over the onions, then add the white wine, beef stock, bay leaves, soy sauce, Worcestershire sauce, vinegar, pepper and sherry. Bring to a boil, stirring frequently, then reduce the heat to medium-low. Simmer for about 20 minutes, then adjust the taste by adding salt and pepper, if needed. Top with toasted slices of bread or croutons and Gruyere cheese. Add the lettuce, kale, cucumber, pepper, quinoa, red onion, oranges and cilantro to a bowl and toss to combine. Transfer to a serving dish or plate, add the avocado as a garnish, and drizzle with tahini-soy dressing. Add all ingredients to a food processor and pulse several times to combine.